Got peppermint 8 up and running, using kernel 4.4.0-141. Works great, quite surprised how nicely to be honest. All new dists (peppermint 9, and other Ubuntu variants) work reasonably well, but boot times are really slow. I was going to give up until I tried peppermint 8 and the system booted up in a minute. After initial peppermint 8 install, I performed the recommended updates and the system was back to taking 5 mins to boot. A quick review showed that the newest kernel (4.15.0-43) was installed, so rolled back to the 4.4.0 kernel and off I went, back to normal. Only other tweak I had to make was install the proprietary WiFi drivers as I found they were more stable (although WiFi did work out of box, but was slow and inconsistent). I was able to edit a video using Kdenlive this morning, no problem. Used proxy clips, but rendering went fine. I feel this Macbook has been brought back to life!! Thanks to you developers who make this happen!! Yes, I was wondering if I could use that kernel for 9, but in the end decided to stick with what works. I may try again in a few months to see if a newer kernel makes a difference. At the end of the day, version 8 will be supported longer than I will have this laptop. I've already started to look for Linux compatible laptops now that I have a Linux setup that works for me (software wise - photo management, video editing, office products). Seems like you can't go wrong with a Dell, but I will continue to investigate prior to pulling the trigger. Dell D series are arguably the best laptops Dell ever made (and best selling). I've been running one 24/7/365 for literally years, and it just keeps on ticking. I've actually gone through four laptop coolers in the interim. These coolers only last a year or two, spinning 24/7, but I digress. That said, Dell D series are getting a little long in the tooth, and the Dell E series laptops are tough as nails, look handsome in business environments, and are a joy to maintain and use. Refurbs abound at pennies on the wholesale dollar. Parts/upgrades are plentiful and dirt cheap. I don't feel compelled to buy a newer model. Matter of fact, I compare everything I look at to the Dell E series lappys - weigh the pros and cons - and others always come up short, in one area or another. Dell E series gives one the best bang for the buck, IMO. I lug mine around, everywhere I go, in my man purse. Any suggestions on the best model to look for on eBay, and what a fair price to pick one up for? Not looking to spend over $400, is that even doable? I’ve seen a Thinkpad X1 carbon for a reasonable price on eBay, and from what I’ve read those run Ubuntu well too. Any suggestions on the best model to look for on eBay, and what a fair price to pick one up for? Not looking to spend over $400, is that even doable? 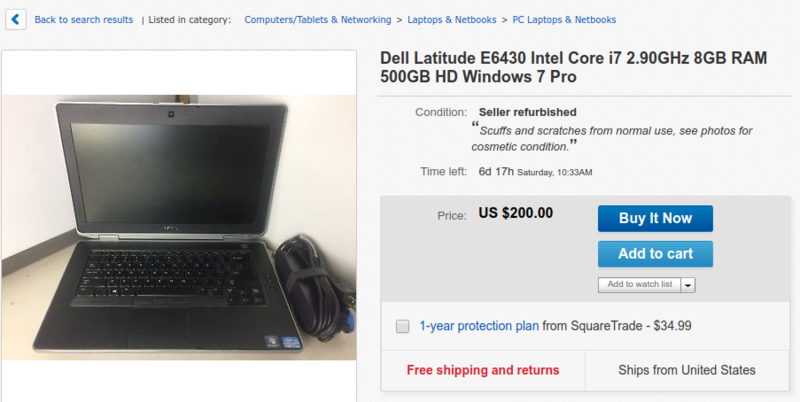 If you're talking about a Dell E series lappy, yes, that's totally doable. I started with something similar, as a base system, then started upgrading it to my satisfaction - probably stuck another $200-$300 worth of upgrades in it, by the time I was done - better NIC - backlit keyboard - slice battery - Sammy primary SSD & 1TB Travelstar secondary HD - docking station - things like that. PCNoSleep is a lot pickier about the display than I am. Finding one with a 'better' display would be a little more expensive and harder to find, if that's important to you, but that's doable, too. Cool, thanks. I'm not super tech savvy so not sure I'm all that keen on upgrading a laptop. That said, I'm sure I can find something similar with a SSD already in it. very easily doable .. what size screen do you want ? I was thinking 15, but seems like these are 14, which would be OK as well. Are these big bricks of laptops, or are they relatively portable? Well I wouldn't want to carry one around all day, they're mainly metal (tri-metal frame, titanium or aluminium lid, etc).. I wouldn't say they are 'large' or 'thick' but they ARE heavy by comparison to plastic consumer grade laptops .. the upside is they're built like tanks, and highly configurable (ie. the optical drive can be replaced with a caddy for a second HDD, , the E6540 can even have a third mSATA internal SSD if you wanna go mad. If you want a 15.6" screen, you're gonna want one that's second number is '5', as in the E6530 or E6540. (I have both and an earlier E6520 .. I like them that much). the 3rd digit is the year, 6540 = 15" 2014 model, 6530 = 15" 2013 model, etc. If you decide to go for one, look for one with a 1600x900 native display, personally I think that's the sweet spot for 15" .. it#s likely where you'll end up setting the thing anyway even if you get the 1920x1080 model, and native resolutions always look slightly crisper than scaled. Personally I'd make 100% sure I didn't get the 1366x768 display on a 15.6 inch model .. in fact I'm not even sure why they even offered this on a high end (and expensive) business model. 1366x768 is fine on the 14" and smaller (in fact it's probably the sweet spot), but IMHO is too low for a 15.6" display. I tend to look for E6530's with a quad core i7 (slightly quicker at compressing the Peppermint ISO's than a dual core but in nearly all other circumstances the dual core is plenty), 1600x900 screen, and an nVidia card (the 'prime' video can be made to work quite well under Linux, but you're likely to just use the intel card most of the time). The E6540 is also nice, but unless you're going to dual boot its intel/AMD hybrid graphics (though more powerful than the E6530's intel/nvidia) will be stuck on the intel ONLY under Linux (not a major problem because you'll use the intel most of the time anyway even on the E6530, and the intel in the E6540 is slightly better) . Or you could get an i5 model even cheaper .. and I doubt if there's anything in it performance wise except in some fringe cases like mine. Very helpful post, thanks a bunch! Looks like that should do the job.